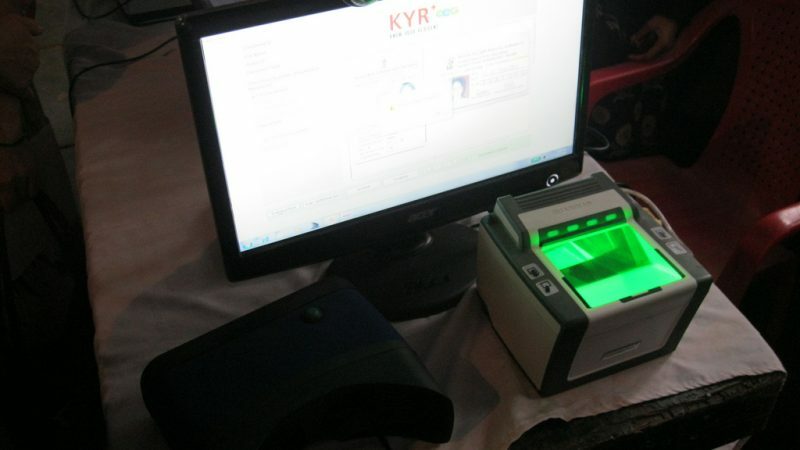 Equipments to capture biometrics information under Aadhaar. Image from Flickr by Julian Correa. Public Domain. Last week, a nine-judge bench of India's supreme court issued a unanimous ruling that Indian citizens have a fundamental right to privacy . The historic decision could have significant implications for India's biometric identity scheme or Aadhaar  (Hindi for “foundation”), the world's largest biometric identification programme. Aadhaar was launched in 2009 in a stated effort to eliminate ghost, duplicate and fraudulent IDs that its proponents said were disrupting the delivery of financial and other social services and causing “leakages ” in government revenue. Aadhaar is implemented by the Unique Identity Authority of India (UIDAI ). Last week's judgment must be seen within the context of a series of citizen petitions to the court attempting to challenge the implementation and linkage of the biometric ID to various government welfare schemes and services. On September 23, 2013, the Supreme Court of India passed an interim order in response to a batch of petitions  that argued that Aadhaar violates fundamental rights of equality and privacy. The petitions specifically challenged the linkage of Aadhaar with various welfare schemes. In their response, the court held that “no person should suffer for not getting the Aadhaar card inspite [sic] of the fact that some authority had issued a circular making it mandatory.” Since then, the court has stated several times  that Aadhaar cannot be mandatory until all the cases are heard in court and disposed of. Theoretically, this made Aadhaar optional. However, various government bodies continued to link Aadhaar to more benefits and services. In 2015, citizens petitioned the court challenging  the constitutionality of Aadhaar. Then-Attorney General Mukul Rohatgi, representing the central government, argued  before a three-judge bench of the supreme court that privacy is not a “guaranteed right,” and that there were “inconsistencies” in the previous apex court orders, despite nearly thirty years of jurisprudence on privacy  in India to the contrary. The government went on to argue that citizens will have to waive certain fundamental rights  in order to have access to government benefits. To settle the matter, the court decided  that the challenge would have to be resolved by a nine-judge constitution bench that would consider the overarching question of whether Indian citizens have a fundamental right to privacy or not. But it took many months for the court to assemble this bench to hear the case. In the meantime, more than 108 services – ranging from bank account access, to key healthcare procedures, to school enrollment — that citizens cannot access without an Aadhaar ID. Yet the UIDAI still maintains that the scheme is voluntary. While petitioners continued to wait for the court to form this bench, in March 2016 the government passed the Aadhaar Act . Soon after, the law was reported to have disrupted welfare schemes  across the country, ‘leaked’ citizens’ data , and from some advocates’ perspectives, become an instrument of surveillance . At one point, Aadhaar even had an officially sanctioned trolling programme  to attack critics of the scheme on social media. Government proponents of the scheme, including Prime Minister Narendra Modi,  made several claims about the benefits of Aadhaar as a tool for combating identity fraud in welfare schemes. But civil rights activists and researchers have shown these claims to be dubious . The magnitude of the Aadhaar scheme and its increasingly broad application to the many processes of everyday life left many advocates concerned  that even if the court finally heard the case and upheld petitioners’ arguments, Aadhaar would have bcome so pervasive that it would become impossible for anyone to reverse the process. Nearly two years after  petitioners challenged the constitutionality of Aadhaar, the supreme court finally convened a nine-judge constitution bench to determine whether Indian citizens will have a right to privacy was formed in July 2017. During the course of the hearing, the tone of the government shifted  to endorsing a ‘Data Protection Act’ instead of a full-fledged fundamental right to privacy. This was yet another attempt on the part of the government to dilute  the right. On top of that, it suggested some names for a committee that would formulate the law, the composition of which raised some eyebrows. In spite of such heavy odds stacked against the petitioners, the supreme court delivered a unanimous verdict  that Indian citizens do have a fundamental right to privacy. Twitterati were quick to point out that Aadhaar is still around. Just a reminder that the larger case of Aadhaar is still going on in SC and the right to privacy hearing was just a key element of it. While the 547-page judgment  will have implications on a host of pending cases, the government's response to the judgment is telling. The law minister was quick to state that the judgment does not affect the biometric scheme. However, a day after the judgment, government officials close to the development feel that they will need to “ring-fence”  Aadhaar and demonstrate to the supreme court that the scheme does protect privacy of Indian citizens.